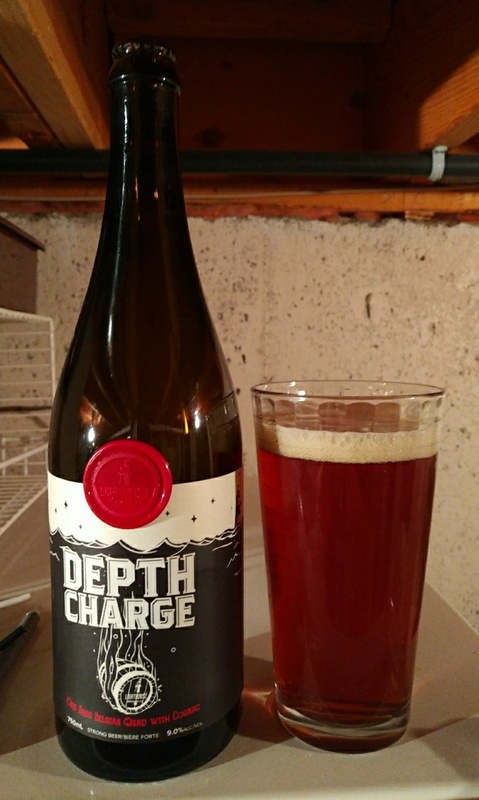 From Victoria’s Lighthouse Brewing comes their “Depth Charge”a Barrel Aged Scotch Ale. The beer pours a deep chestnut brown colour with reddish notes with an beige head. The aroma consists of vanilla, oak, roasted malts, caramel, chocolate, fruit and sweetness from brown sugar. The flavour is of vanilla, oak, roasted malts, some ash, brown sugar, caramel, toffee, chocolate, earth, resin, tobacco, leather, bitterness and alcohol. The alcohol content comes in at 9%. It has unintentionally been a while since i have had a beer from Lighthouse Brewing. This one was very well made and I am happy that I noticed it on a shelve at a Vancouver liquor store. With April comes one of my favourite beer festivals in the province in the Fest-Of-Ale. This was the 21 annual event in Penticton and was once again a great party! This two day festival took place on April 8th and 9th a Friday and Saturday. Once again the festival was able to have an indoor and outdoor section that included beer, food and live music. The Penticton Trade and Convention Centre was again the host location of the festival. Every year the festival invites new breweries to the festival. This year there was just over 50 breweries and cideries in attendance. On the Friday I was able to get into the festival early as I was part of the Media for the festival. It is nice to get some photos before the place gets packed! The Friday event ran from 4pm until 9pm and was a great mix of people. The crowd that comes after work to drink is quite civilized. Friday’s crowd seems to be more interested in getting to know the flavours and brands on hand at the festival. Once again the fist day of the festival was a total blast. The breweries involved were great and the people attending where all really excited to be there. Like always I took the Friday easy as I was once again one of the Judges for the festival. After our session of Judging on Saturday the judges all headed back into the festival for day two. For the general public the festival ran from 12-6pm. Like always day two for me is more about the food and the people than the beer as we have judged so many beers. There were still lots of great beer that I sampled though especially some of the beers that we judged as winners. With the second day being during the day the crowd seems to both be younger and less knowledgeable about craft beer. Saturday is more rowdy and there are way more costumes. Something that seems to be very popular at some beer festivals and even more at music festivals. At 3pm all of the judges had to be up at the main stage that is located in the middle of the indoor portion of the festival. This is where the awards where given out to the winning breweries and cideries. Kim of DogLeg Marketing sent me these following photos of the winning breweries. I could not take them as I was standing on the stage in behind the winners. Here is the list of winning beers as chosen by the judging panel. Here are some more photos from Kim of DogLeg Marketing. Once again the Fest-Of-Ale was a massive success in 2016. If you can only make it to one beer festival in the province next year this is a great contender! I forgot to take photos this year of the pop up liquor store but it was once again had an amazing selection of great beers. I was able to pick up some from Torchlight Brewing that is usually only available in a small area in the Nelson area.